his pretty mountain village lies on a sunny plateau south of Visp above the Mattertal valley that leads to Zermatt. 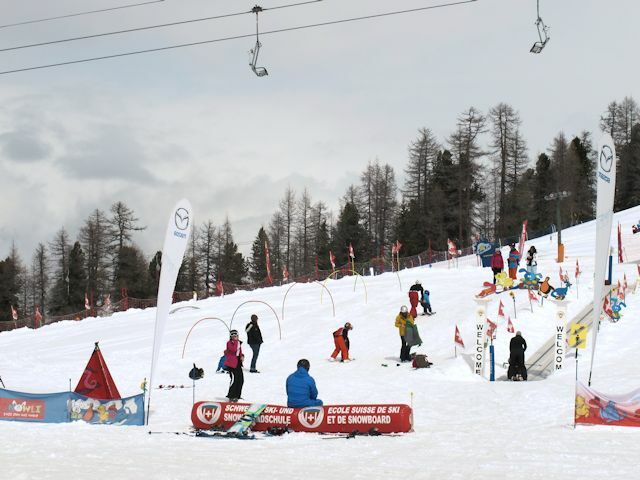 It's family friendly, particularly for intermediates, but not really a beginners resort with most runs, including the run back to the village, designated as reds. 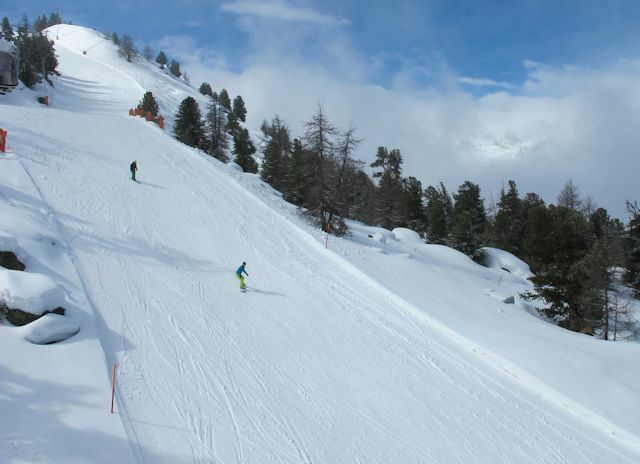 Although a lot of slopes are south-facing, most of the runs are reasonably high and snow-sure. With the impressive Zermatt and Saas-Fee so close, Grächen is comparatively uncrowded and seems a genuinely friendly place to visit. Grächen deserves to be better known, but you can't fault the village for trying. It ran an innovative campaign in 2014/15 to peg cash payments in Euros at a generous exchange rate against the Swiss Franc of 1.35, and has worked hard to ensure there is plenty for kids to do. The lift system is modern and, apart from one short t-bar at Furggen, you can get around the resort without using surface lifts. A new chairlift will obviate the need even for that t-bar when it is completed. The only black run goes down to the Bäargji lift. From the Seetal summit, it is possible to ski very agreeable red runs all the way back into Grächen itself, with a vertical drop of 1250m. 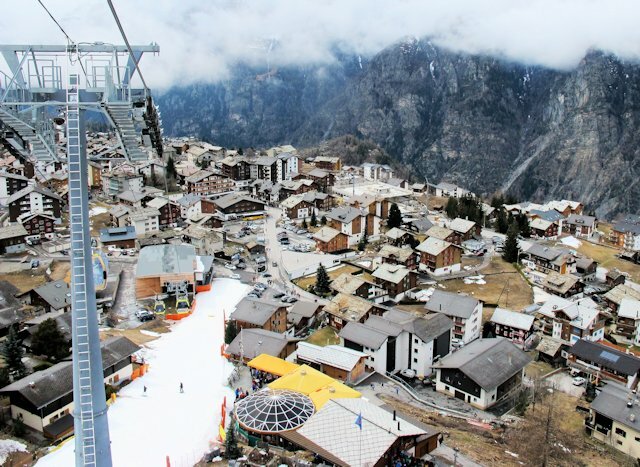 With the village situated so high, the resort run is normally open througout the winter ski season. There's a cute little mountain restaurant at Stafel, and the main restaurant at Hannigalp has free wifi. The best destination to access the downhill slopes by public transport in this ski area is Grächen, Post. The lifts are about 3 minutes from the bus stop, just turn right uphill out of the bus terminus. Direct buses often run from Visp, obviating the need to change at St Niklas. The Snow'n'Rail scheme only applies for 6 day passes. The resort operates the Snow'n'Rail scheme, providing a 20% discount on the combined travel ticket and lift pass. From Zurich the least travel time is 2 hrs 48 mins with as few as 1 changes. Typically, an adult one day combined ticket is 234.00 SFr, reduced to 142.40 SFr with a Half-Price card. From Basel the least travel time is 3 hrs 14 mins with as few as 2 changes going via Visp / St Niklaus. Typically, an adult one day combined ticket is 227.60 SFr, reduced to 139.20 SFr with a Half-Price card. From Berne the least travel time is 1 hr 49 mins with as few as 1 changes going via Visp. Under the combined ticket scheme the additional charge for a two day pass is 49.60 SFr. The road distance from Zurich is around 341 km and the journey time is roughly 3 hrs 47 mins. The road distance from Basel is around 216 km and the journey time is roughly 3 hrs 30 mins. The road distance from Geneva is around 226 km and the journey time is roughly 2 hrs 43 mins. 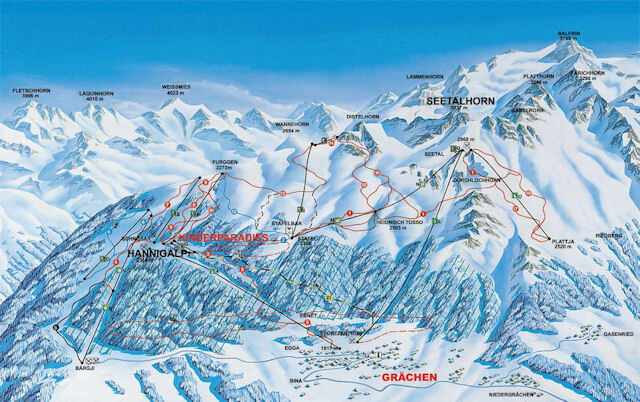 Destinations in the region include Saas-Grund, Saas-Fee and Zermatt . $$$ Familienhotel Desirée, St Niklaus (3*) Family hotel.